Anyone that is already enjoying games and bingo events with their BingoZino login may already know that the site has changed hands since its inception in late 2013. The site was originally hosted by IGT, who in turn decided to move it onto Cassava Bingo network. 100% WELCOME BONUS US TO £50New Customer Offer. T&Cs Apply. 18+. Please Gamble Responsibly. Come and join the fun at Bingozino now and enjoy plenty of games and promotions. This doesn’t mean that BingoZino misses out on any of the slots and bingo action, far from it – as the Dragonfish network is as alive and as buzzing as it ever was, with many sites continuing to adopt similar games, promotions and deals across a wide-spanning website family. This can be to a site’s detriment – that things can seem too familiar – however, we doubt anyone coming across BingoZino games for the first time would consider it to be worth ignoring. Other BingoZino review pages will advise that there is more to learn about with the site than just its opening deal – though we are particular fans of the offers that are being granted here. We will cover them in more detail as the review progresses – and we will also take a closer look at mobile play, which Dragonfish sites generally tackle very well indeed – as well as any of the important terms and conditions that can come attached with a membership here. All in all, this is a very colourful, cheery site that doesn’t skimp on the fun – and while the big, outlandish graphics may not be to everyone’s tastes, they certainly do the work when it comes to enticing new players to get involved. The welcome deal here is fairly similar to those which are offered through BingoZino sister sites, anyone signing up for the first time can take advantage of claiming up to £50 free bonus in a cash matching deal equivalent to 100%. You are therefore doubling your money and this is never a bad thing! £10 in, the minimum, will give you £10 to spend on bingo – and this can escalate all the way up to £50. You can also grab 25 free spins on a big name slot game pre-picked by the brand through the BingoZino promo code, which is subject to change occasionally. There’s always wagering requirements to bear in mind if you are the type of player who is keen to cash out winnings as soon as they become available. Luckily, the terms here are very reasonable, certainly if you’re a bingo player. 4x wagering will apply for bingo credit, meaning you will have to play through the amount you have received four times over before you can cash out. There are more details available through the main website which, thankfully, are more than easy to spot. Do also be aware that a £2 cap on anything you can win from bonuses via free spins will also apply, and that if you do take on bonus codes that focus on slot games in future, up to 80x wagering may come into force. Well worth keeping an eye on your money in that case! There’s stacks of regular bingo events and jackpot games that roll around on a regular basis, though many of these will be familiar to players who have registered on and have enjoyed Dragonfish sites elsewhere. Some brands you may have tried include Robin Hood Bingo and Spinzilla which both feature similar software. While this does mean that the site lacks a little originality as far as treating their loyal players is concerned, this doesn’t mean that you won’t reap the rewards long term. The regular events and offers that spring up here are all fun and well thought-out, meaning that the brand does at least have creativity in its corner over many samey sites elsewhere that fail to offer a little bit of flair. 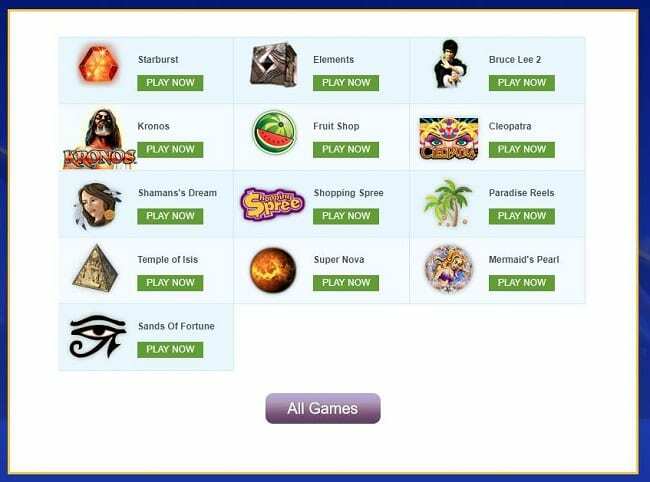 Chances are you’ve seen plenty of these games at BingoZino before – Fluffy Favourites, Temple of Isis slots, Kronos, Starburst, Cleopatra, all big names and all great games! However, seasoned gamers will have gotten used to these standards – meaning that this may well be a site that appeals more to casual players, those who prefer a bit of bingo action, or both. In any case, there is at least a nice selection of bingo rooms – though you won’t be able to take a closer look at everything on offer until you’re fully registered and signed in. Some sites don’t give you a sneak preview at all – meaning we’re not completely irritated – but it does seem that the site is using an older form of Dragonfish to highlight its games and features. The games here are great – but we’re not sure they are in as original a supply as, say, sites operated by the likes of Nektan or Playtech/Virtue Fusion. Dragonfish is great software to go for if you are looking for simple gaming action that can be enjoyed via PC, laptop, mobile or otherwise. With your BingoZino login you’ll be able to find all this out. This flexibility and focus on fun is what makes the brand and software so popular, they certainly get bingo right as well as mobile play. Though this, again, does seem to be an older or more watered-down version of the platform that has been evolved and expanded upon in recent months. It is a similar issue facing sister sites such as Bid Bingo. However, the site here does at least load well and the main software used to showcase the games, while looking a little dated on some platforms, is both speedy and comprehensive. With these elements in mind, we can hardly complain – this is shaping up to be a site which may pull in the casual gamers first and foremost, though that’s never an issue in our eyes. For many people, e-wallets prove to be quicker, safer and more convenient than their card equivalents – the choice is ultimately yours, of course. There are many pay by mobile bingo sites available now where you can make deposits through your phone bill. Withdrawals here are generally very reasonable though you will need to keep a close eye on your account for around a week before you’ll get your requested cash. There are longer timescales out there – and e-wallets will generally provide you with speedier access to funds, but don’t be surprised if you are waiting for money after a few days. You can take out as little as £5 here, great news as this will mean that you don’t have to necessarily build up a stack of cash to get flush from the site. Do also bear in mind that you’ll need to have ID on standby as you may be requested to confirm that you can legally play in your country. As you would expect from a Dragonfish site, there is plenty of focus here on mobile bingo play – you simply need to head straight to the main site from your browser and you’ll be presented with the most flexible and appropriate version of the website and games catalogue for you. You can enjoy plenty of BingoZino mobile features through your smartphone or tablet simply by using the web browser. The same promo codes and deals are still available however you play. This is a top feature of our BingoZino review as so many players love using mobile sites. This means that there are more than a few reasons why you should look into gaming on the go first and foremost, you’ll neither miss out on any important promo codes or deals, nor will you find yourself stranded with a version of the site and games line up that barely functions. It’s therefore always comforting to see sites like this go the extra mile and make a little bit of effort with regard to their portable players. Don’t worry about having to download an app or program, visit the main site directly and log in at your own pace. BingoZino is one of many sites that is continuing to do a great deal of good for casual players and is making the most of the best that Dragonfish has to offer – and while things may seem a little samey here and there, what’s here is very appealing, lots of fun and both safe and fully authorised for use. Join today to make the most of their BingoZino promo code and latest deals they have to offer. If you enjoyed our BingoZino review, be sure to check out the others on our site.